Some people count the money they make. Some people count the money they make for others. Count Frank and Sherry Shults—and all the associates of Shults & Company—in the second group. And the count is impressive. Since 1995, Grinnell Rotarians and Shults & Company singers and musicians have raised $87,000 for worthy Grinnell causes. 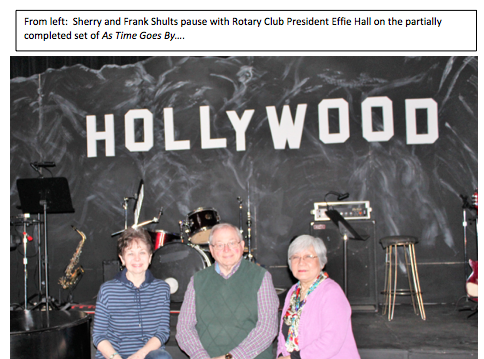 Frank Shults notes that “some of this “$87,000 … includes two grants from the District 6000 Rotary Foundation.” With the production of As Time Goes By and Other Great Movie Songs, April 12-14 at Hotel Grinnell, Shults and colleagues hope to top the $100,000 mark. This year’s drive will benefit the Unity Point Health-Grinnell Regional Medical Center’s Paul Ahrens Fitness Center. “We hope to acquire two ellipticals, two treadmills, and other much-needed equipment as recommended by Director of Wellness, Fitness, Integrated Medicine, and Day Camp for GRMC, Chad Nath,” states Frank Shults. 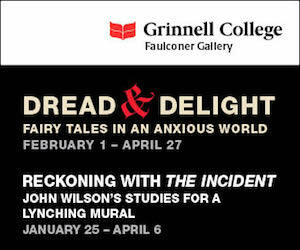 Other Grinnell groups helped by Shults & Company past productions include the Grinnell Senior Center, middle and high school music departments, the Grinnell Recreation Department, The Grinnell Area Arts Council, the Drake Community Library, and Grinnell Production. Singers in Shults & Company are Keith Briggs, JoAnn Britton, Gailanne Dill, Tim Dill, George Drake, Bill Hammen, Austin Jones, Debby Pohlson, and Frank and Sherry Shults. Making up the band are Mary Fopma, piano; Kent Kastendick, keyboard and saxophone; Anthony Nieuwsma, guitar and vocals; Adam McFee, percussion; Rick Young, bass and vocals; and Tara and Jenae Kastendick, incidental instrumentals. 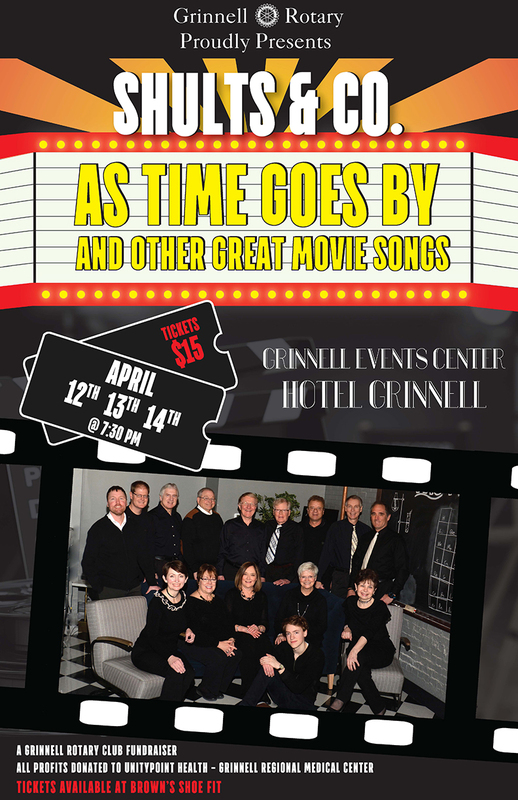 As Time Goes By and Other Great Movie Songs will feature famous songs from films of the 40s and beyond. Something for everyone is the goal. “It kind of developed when we got married 37 years ago,” states Sherry Shults on the origins of their musical fundraising efforts. A mutual interest in theater brought them together. They recall seeing one another in the third-floor music room of the building, then the high school, that is now Hotel Grinnell. At one point, Frank played Professor Harold Hill to Sherry’s Marian the Librarian. Frank and Sherry performed with the Town and Country Singers and raised money for the Band Boosters in their pre-Shults & Company days. As time went by, Frank joined Rotary and served as president in 1994-95. Considering a service project, “Sherry and I did some talking,” he recalls, which led to the proposal of music as a fundraising activity, sponsored by the chapter, to assist one of Grinnell’s organizations or agencies. Since then, the group that came to be called Shults & Company has established itself as one of Grinnell’s premier performing ensembles. Every other year, Rotary-sponsored productions contribute to the community in the Rotarian tradition of service above self. Of course, musical reviews do not create themselves. An extraordinary amount of effort goes into the conception, the planning, the logistics, and the production of such an event. A music review is not simply one song, another song, and so on. 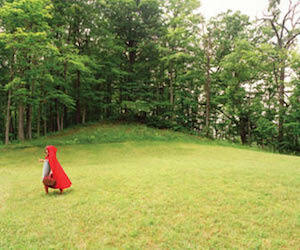 A review carries a theme, and dialogue unites the offerings. This aspect is Sherry’s specialty. She writes the “in-between stuff”; she also selects the songs, weighs various arrangements against one another, presents her suggestions to Frank, and together they choose the material that makes the final cut. Sherry’s 32 years of work at the Grinnell College library have sharpened her research skills just as Frank’s 46 years in education provide a solid background for suggesting, instructing, and directing. Copyright regulations require meticulous attention. For example, everyone must work with an original copy of sheet music—no photocopies. Sometimes it is necessary to purchase extra copies in various keys to fit the range of a particular performer. Fundraising requirements add another level of complexity. No one can profit so much as a dime. Grinnell’s Rotary sponsors the event but does not retain any revenue beyond expenses. All funds above cost go to the designated organization—in this case, the Ahrens Fitness Center. Rehearsals for a Shults & Company production begin three to four months before the curtain goes up, take place four times per week, and last two to three hours. A Shults & Company performer is dedicated. “People give up vacations for this,” Sherry notes. And behind-the-scene contributors also play important roles. For example, Frank expresses gratitude that the Episcopal Church accommodates the company as a rehearsal spot. Tickets for the production are only $15 and are available at Brown’s Shoe fit. The show runs April 12 through April 14, starting at 7:30 p.m.
“You played it for her; you can play it for me,” orders Bogie-as-Rick in Casablanca, referring to “As Time Goes By.” In Grinnell, Shults & Company will play it—and a good deal more—for all of us.